Now as a mum-to-be I haven't experienced this yet, but am fully aware - and you should be too. Lets discuss hair...and more frankly, hair loss. During your pregnancy you'll have noticeably thicker and healthier hair (if a little brittle) during the anaphase but 16 weeks after birth you'll experience an alarming rate of hair loss - the telophase (terrible phase, we say). You're not losing your crowning glory as such, i.e. the hair you already have, but over 9 months those 100 hairs you should normally shed per day don't. They stay put. So you have this lustrous, glossy mane for 9 months - and then you'll get a shock in the form of losing a dramatic amount of hair - almost immediately after your newborn's arrival. And the more you stress or worry, the more you'll exacerbate the problem - so don't! The reason I've done this post today is because I chatted to my hairdresser last week who regaled me with tales of how she was in tears as clumps of hair fell into the plug hole one day as she nonchalantly washed her locks. After her ordeal, she sprinted to her hairdresser friend sobbing her heart out....and they all laughed at her! No, they're not mean, they just knew that is was simply a standard part of motherhood - post preggers baldness (I am joking here). Seriously though, you won't go bald - you'll simply shed what SHOULD have been shed during pregnancy - and didn't. Most women experience their hair falling out in one go, so it does feel thinner - but actually it isn't, it's just returning to normal. 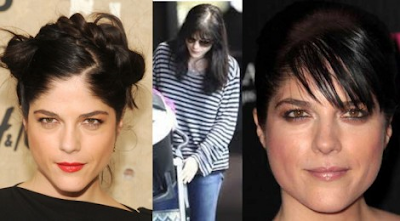 However, a huge number of women may not ever recover from their hair loss, like Kate Hudson, Selma Blair and January Jones - whose hair looks noticeably finer post bubba. But the issue is not just losing hair. It seems even famous figures like our dear Kate Middleton's envy-inducing locks are looking a little lacklustre and fuzzy after birth. The world's most exemplary hair is now being critiqued for being less than perfect (you should have seen mine this morning). We forget she does not have Richard Ward on speed dial (erm..) and has a newborn shoehorned into her armpit - so we can forgive her for being ever-so-slightly windswept once in a while. NB: leave her alone! The problem is hair does become progressively drier during pregnancy (yeah, cheers) as hormones reduce the amount of oil our sebaceous glands produce - so you just have to ensure you have hair treatments, regular conditioning and a good session with the serum post blow-drying. It seems a stark and harsh contrast to all the pains and aches and everything you've been through for 9 months, then the pain and endurance of labour - and the final cherry on the cake is the feeling you're losing your locks - but don't worry mummies, help is here. Talking from a mum-to-be point of view, I've experienced the 'unruly' side of the coin, it's literally unmanageable - and my yearly brazilian blow can't help me now - as you're not allowed to have them whilst preggers! Encourage healthy hair growth with PK4 Hair Soya Protein veggie-friendly supplements. After 4 months hair should be massively improved - we love these effective hollistic alternatives to the usual gelatine based proteins for hair and will be gobbling them straight after birth! Used together, these gorgeously natural products limit hair thinning, hair brittleness and may also help reduce hair loss. Newly launched (August) DGJ has done it again with his organic, amazing argan-oil formulated shampoo and conditioner, love - and purse friendly. With vitamin B6, grapeseed and bark extract, any fuzzy, unruly mum will love this shampoo to reinstate volume, vitality, dentsity and shine - well worth the splurge. Limp is not often a word we associate with BUBS mummas, and certainly not when it comes to locks. There's often 3 for 2 deals on this wonderfully delicious scented (subjective) shampoo - specifically designed to give volume to fine, limp and lifeless locks.